Malaria, one of the major tropical infectious diseases, is caused by three species of Plasmodium (single-celled microorganisms) which parasitise human red blood cells and destroy them. 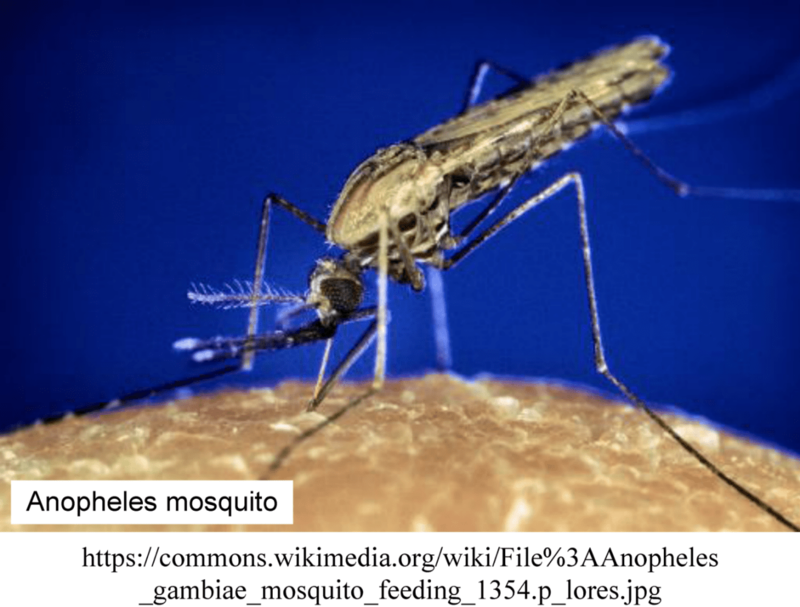 Malarial parasites are transmitted by Anopheles mosquitoes. For further details, please refer to WHO Factsheets. Anopheles mosquito lays its eggs in standing water and the larval stages thrive here. Water can stagnate in a ditch, an opened tin, pots, car tyres and even septic tanks with partially open cover or open air vent through which adult mosquitoes can enter and exit freely. Do not allow water to stagnate around your premises. If you are maintaining a lily pond in your garden, or having any open and unavoidable stagnant source of water, make sure to grow small larvivorous fishes such as Gambusia and guppies in it. Do not leave your septic tank (if you have one) partly or fully open. Never keep the air vent pipe of your septic tank (if you have one) uncovered. Use fine wire or nylon monofilament or fiberglass mesh to cover it tight. Do not leave any part of the slab of the septic tank cover open partly or fully. Even a tiny opening, if found, must be sealed off. The clear water that comes out from the last compartment of the septic tank must be drained into a soak pit which is protected from entry of mosquitoes. This water should never be let outside your compound. Prevent entry of mosquitoes inside your house by fixing fine wire mesh or fiberglass mesh in the window openings. Kill all mosquitoes that have already entered. If you are visiting a malaria infested area, make sure to take preventive medicine (consult your doctor) and also avoid mosquito bite by using mosquito nets, mosquito-proof rooms or by applying mosquito repellent on the skin. The mosquito repellants available as evaporating liquids and smoking coils are reported to be harmful. Mosquito blasting electric induction coil bats are extremely useful to finish off the few mosquitoes that may be still left inside your room. Consult your doctor. Make sure to complete the course of the medicine as advised by your physician.